Part 2 of 2: Yesterday I reviewed disc 1 of Redeemer of Souls. Today, the bonus disc! Sometimes a bonus CD is made up of obvious castaways. Other times, such as with the most recent Black Sabbath album, the bonus disc contains some serious gems. I don’t know why everybody wouldn’t just go and buy the “deluxe” editions to get the bonus CDs, relatively cheap as they are. For whatever reason, deluxe editions with bonus CDs flood the stores today. 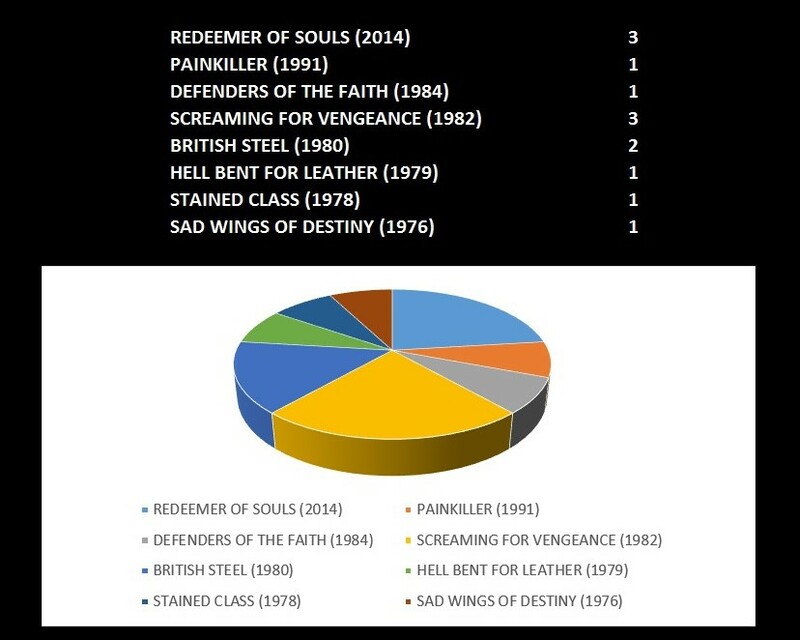 Thankfully, Judas Priest put just as much effort and passion into these five songs as they did the 13 on disc 1 of Redeemer of Souls. “Snakebite” inhabits an 80’s-like Priest vibe. Dare I say it? This would have sounded at home on Ram It Down, but it’s better than that. “Tears of Blood” on the other hand reminds me of “The Sentinel”. This is one of my favourite songs on the whole Redeemer of Souls set. There’s no reason a song like this shouldn’t be a single. I don’t know how songs like this are selected for a bonus CD on a deluxe edition. Granted, disc 1 of Redeemer is topped to the brim in quality. Still in an 80’s Priest mold, “Creatures” boasts a catchy chorus within a heavy song. (The title “Creatures” is short for “Creatures of the Night”, so I’m pretty sure they shortened it to avert lawsuits by G. Simmons.) What is it that has injected this youthful rediscovery of classic Priest melodies and riffs? Has Richie Faulkner re-ignitied the passion for writing those kinds of songs? “Bring It On” is quite different from the other songs on Redeemer, but it certainly shares classic metal traits with them. I could imagine a song like this going over quite well live. Once again I ask, how does a strong contender like this get sent to the bonus CD? “Bring It On” is a fist-pumper, pure and simple. It’s uncomplicated by flourishes or production. Truthfully, this song gives me chills. I think Priest get their point across. Before making closing arguments, I just want to briefly talk about the packaging and production. I’m on record as being a fan of Mark Wilkinson, and his work here is primo. Drawing on past characters as the Angel, Painkiller, and even Marillion’s Torch, here comes the Redeemer of Souls. The art looks great on the embossed, metallic-looking outer cover. 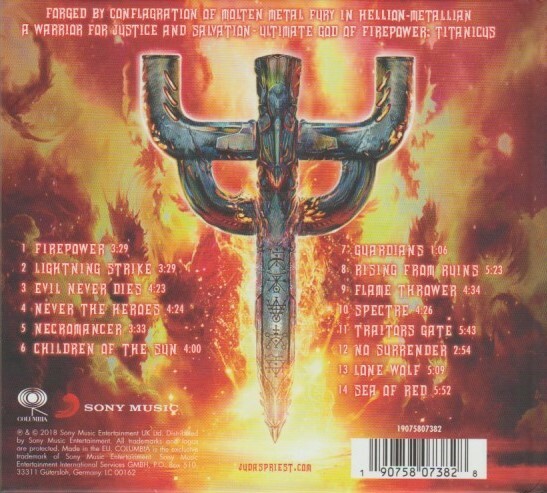 Glenn Tipton and Mike Exeter produced Redeemer of Souls, and by and large I think they did a fantastic job of capturing all that is good about Judas Priest. I find the mix to sound muddy. Maybe the CD was mixed too loudly, or perhaps I’m just not playing it loud enough. All I know is that I have a hard time hearing subtleties. 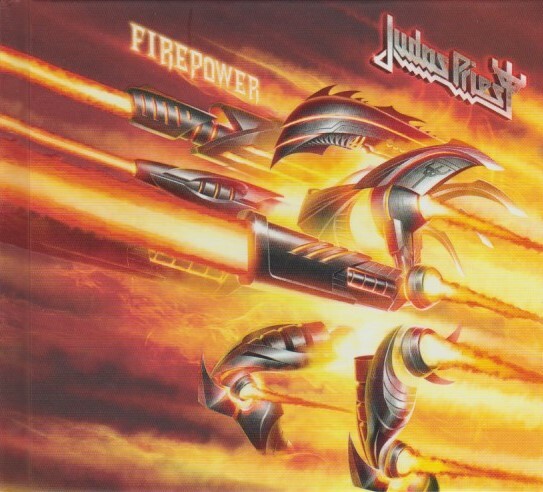 If Redeemer of Souls goes down as the final Judas Priest studio album, let it be known that it is a dignified statement. The band clearly worked hard on it (not that they didn’t for Nostradamus). Early feedback from fans is that they are by and large very happy with it. This was in spite of some uninspiring early song previews. When you listen to Redeemer of Souls, you will understand that it is not about individual songs so much as about the entire body of songs. All 13 (or 18) tracks are part of a whole that is best enjoyed whole.